Learn the ins and outs of sales techniques with this comprehensive and accessible guide that is the crash course in how to sell anything. Sometimes, it seems like learning a new skill is impossible. But whether you are interested in pursuing a full-times sales career, want to make extra money with sales as a side hustle, or are just looking to turn your hobby into a business, everyone can benefit from knowing how to sell. With Sales 101 you can start selling now. This clear and comprehensive guide is perfect for those who are just starting out in the sales field. Presented with a casual and an easy-to-understand tone, it gives you the information and training you need to get started. 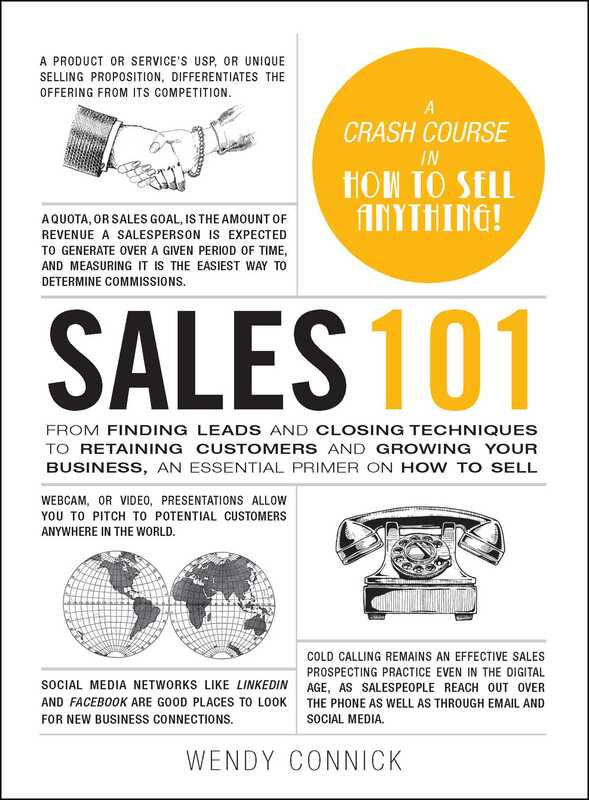 Sales 101 teaches the basic sales philosophies and tactics that have been successful for centuries, along with newer, more up-to-date information about using the internet and social media to find leads and increase your customer base. Whether you need guidance in making a presentation or closing a deal to handling rejection or managing your time, Sales 101 shares the best advice and solutions to prepare you for a career in the sales field.